São Paulo's Fazenda Boa Vista development is a massive 1,800 acre residential and hospitality complex rolling with perfectly trimmed hills, deep blue lakes, and untouched landscapes. The property features an array of amenities such a clubhouses, an equestrian center, golf course, tennis courts, five star hotel, and a spa. 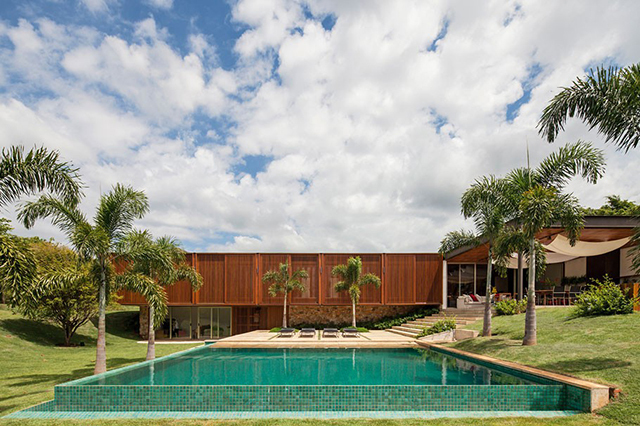 Also within the complex is a collective of newly built residences designed by Brazil's architectural headliners, Isay Weinfeld, Arthur Casas, andPaulo Jacobsen and Bernardo Jacobsen of Jacobsen Arquitetura. Jacobsen's new MDT house is in the well designed company of Fazenda Boa Vista's newly built residences. The home is sectioned into three rectangular volumes that are juxtaposed together to create three full patios, a gourmet kitchen, home theater, large entertaining areas, a kids room, library, and a swimming pool. The outside of the MDT home is outfitted with a stone wall covered in vertical wood panels ranging in hues of brown, orange, and yellow. The stone and wood wall constitutes most of the exterior walls, except for the areas that overlook the pool and courtyard. 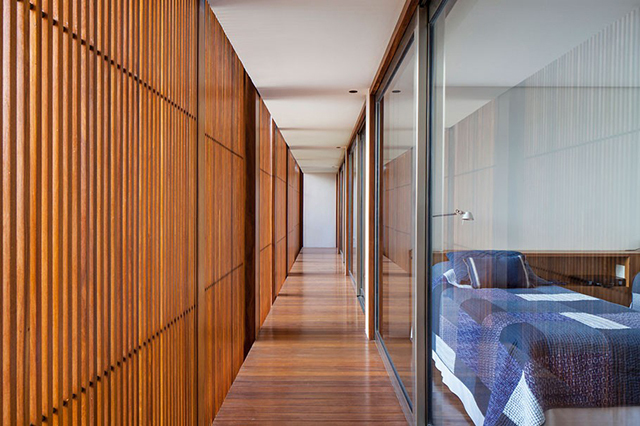 Here, the bedroom suites fit straight into one of the rectangular volume, each bedroom has a glass wall so guests have a view of the swimming pool through the wood panels. One feature not to be missed is the large wood covered patio that overlooks the pool. On the patio, modern furniture pieces create unique conversation areas, and the gourmet kitchen is only steps away to feed the need for serving and entertaining. 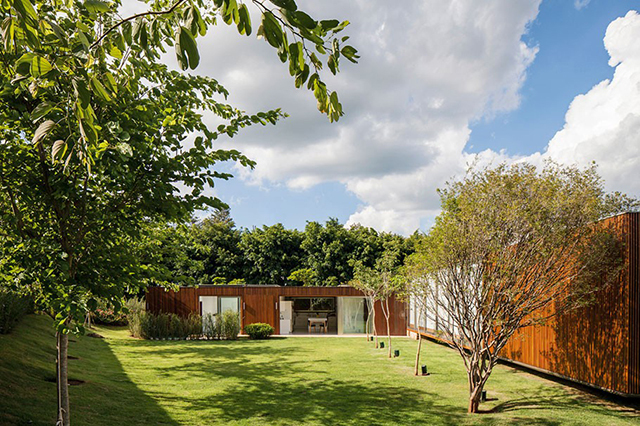 The architects took a topographical approach to develop to sculpt the land of the MDT House. Variations in floor and ceiling create different ceiling heights and different relationships with the garden, sometimes enabling direct access to the gardens and pool.